Tomorrow is the National Handloom Day. Do celebrate by wearing something thats handwoven – a scarf, a shirt, a kurti, a sari or a dupatta..anything. This post is for novices like me who don’t know much about the different weaving techniques and maybe don’t even know the different weaves of India – there are 120 of them !! How do you know that the stuff you are buying is handwoven, a genuine handloom product ? Here are some ground rules that I have started to follow ever since I realised that many large retail stores do not sell genuine handloom stuff, but pass off many saris as handloom. Pure cotton is not pure cotton, but mixed with polyester or other manmade fibres and a novice can never figure these things out. Buy only from Government run cooperative outlets – the biggest of them is of course Co-optex. You have many others like Apco, Boyanika, etc. I bought this online from Co-optex and it cost me Rs. 2227/-. I don’t see that as being expensive because I know that most of the money would reach the weaver. A handloom weaver is an artist and handloom weaving is a dying art. But, it can be revived and all it needs is for each of us to buy atleast one handloom product in a year. 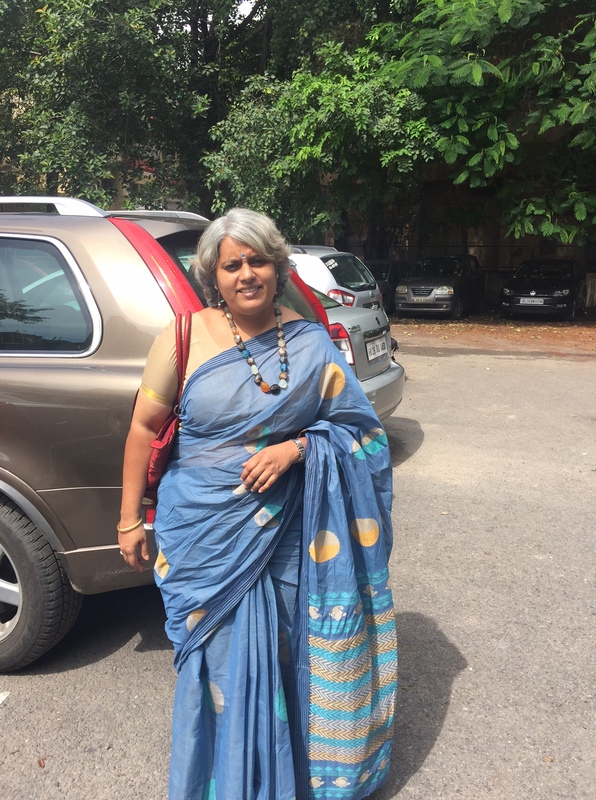 Look at the exquisite weaving on this sari and this is organic cotton – today was super humid in Delhi and I wore this for the board meeting at Goonj. The super humidity just vanished and this beautiful cotton sari kept me cool. Why buy synthetic stuff when we have such a rich heritage of handlooms ? Its an appeal to everyone reading this blog – please wear something hand woven tomorrow and tweet your picture with #Iwearhandloom and the next time you go buy clothes, try and buy atleast one hand woven stuff. Please buy from the government run outlets or accredited online portals because then the weaver gets the money. Not trying to offend the designers but unfortunately there are some designers who charge 5 times the price and pocket it all, not giving the weaver his due. In Delhi do check out the Dastkar Haat Samiti at Khan Market or Dastkar, at Andheria More. The Cottage emporium and Handloom Houses everywhere have handloom stuff. Co-optex has a boutique at Khan market. Wonderful Mani. What an inspiring love story you and Raji are! !